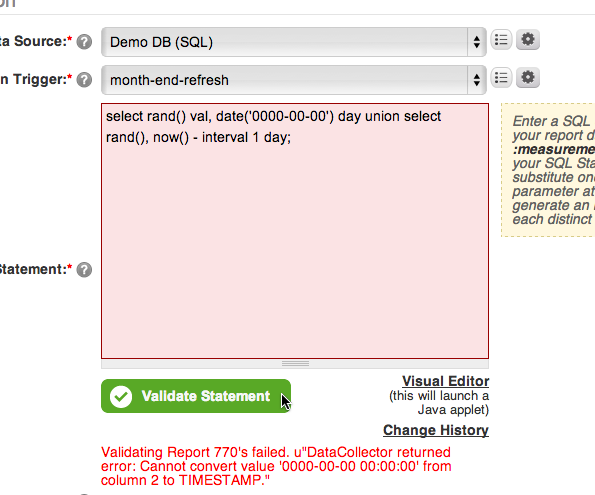 Help & DocumentationGetting DataConnecting To Data Sources JDBC ConnectionsValidation errors: "Value '0000-00-00' can not be represented as java.sql.Date"
Validation errors: "Value '0000-00-00' can not be represented as java.sql.Date"
This is a MySQL-specific problem that does not happen often. It is caused by storing zero dates ('0000-00-00 00:00:00') in MySQL and trying to convert those into date objects in Java. Unfortunately, Java does not understand dates in this format, so the MySQL JDBC driver will throw this error by default. Apart from modifying the source data, the easiest solution is to modify the JDBC connection URL for the affected Data Source to include ?zeroDateTimeBehavior=convertToNull as shown below. 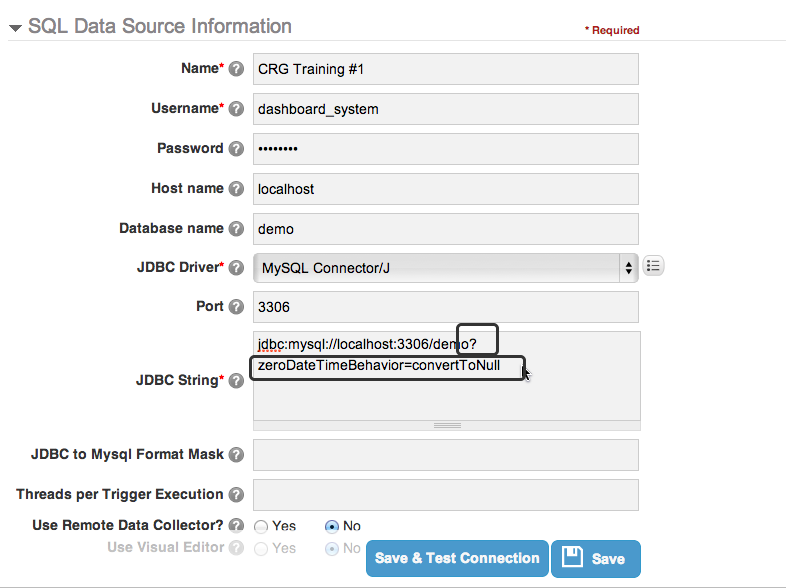 For more information about this JDBC parameter, see the Datetimes bullet under section 20.3.3.3.3 of the MySQL Manual. 1.1. 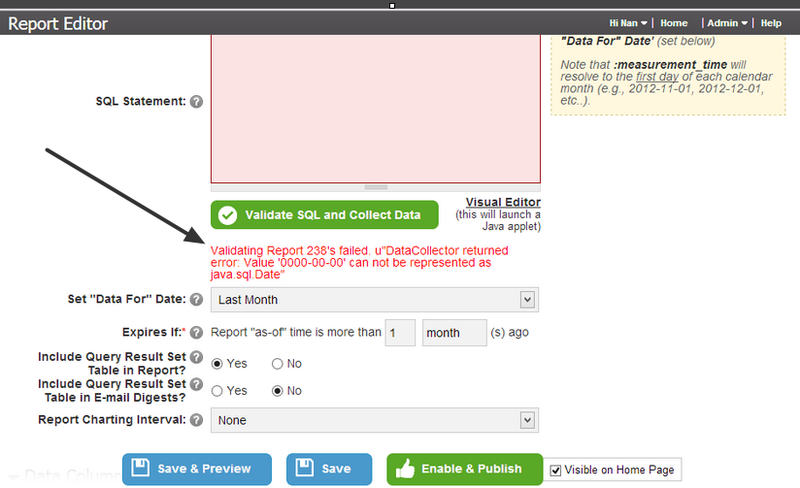 Example: "Value '0000-00-00' can not be represented as java.sql.Date"
1.2. Example: "Cannot convert value '0000-00-00 00:00:00' from column N to TIMESTAMP"
Make sure the data source drop down is pointing to the appropriate data source, then click the gear icon to the right to edit the data source. The suggested fix is to append '?zeroDateTimeBehavior=convertToNull' to the end of the JDBC string. 1.6 What does the Refresh Metadata button do? 3.1 What are External Reports? 3.2 Why do I see an empty page when I set my External Report to display in Viewer? 5.3 Validation errors: "Value '0000-00-00' can not be represented as java.sql.Date"
38.4 What is the difference between SalesForce plug-in and SalesForce SOQL plug-in?